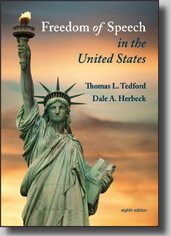 Tedford and Herbeck, Freedom of Speech in the United States, 8 ed. This award-winning textbook explores the evolution of our present-day free speech rights through major legislation and Supreme Court decisions. Guiding readers to an understanding of complex concepts with clear explanations, brief abstracts of major court cases, and numerous study aids, it shows how historical challenges to freedom of speech arise anew with the emergence of new technologies, political issues, and social concerns. Thoroughly updated, the eighth edition integrates recent laws, regulations, and court cases, showing how historical issues—such as sedition, prior restraint, defamation, and obscenity—shape contemporary concerns such as access to government information, Net neutrality, Internet Service Providers’ liability, streaming video and copyright, privacy and defamation in social media, reporters’ privilege, student speech rights on and off campus, and national boundaries in the Internet age. Historical perspective shows the rich diversity of events and cases that shape current law and debate. Conceptual structure shows how historical laws and cases shape current policy, even in the Internet Age. Clear, colorful,substantive explanations illuminate historical and contemporary cases, engaging student readers and inviting further exploration. Landmark case boxes summarize key facts and significance of major Supreme Court decisions. Excerpts from major cases, throughout the text, allow students to engage with the decisions that form First Amendment law. Clear organization and abundant internal summaries guide student reading in a superb introduction to free speech history, perspectives, and laws. Photographs, illustrations, and diagrams highlight significant cases and bring history alive. Recent legislation and Supreme Court decisions, including important rulings on threatening speech, the right not to speak, privileged communication, streaming video, and abortion clinic protests, are incorporated. Current controversies are reflected and updated, exploring the implications of historical laws and precedents in the Internet age. Enhanced and updated graphics and photos aid student comprehension and highlight current issues. Instructor's manual includes model syllabi, assignment and project ideas, term paper topics, classroom exercises, video lists, and other resources. Upon publication of the first edition of Freedom of Speech in the United States in 1985, the Speech Communication Association (now the National Communication Association) presented the author with the H. A. Wichelns Memorial Award for "outstanding scholarship in communication and law." Following the publication of the fourth edition, the Text and Academic Authors association presented Freedom of Speech in the United States with the William Holmes McGuffey Longevity Award, as a textbook "whose excellence has been demonstrated over time." In 2006, the National Communication Association presented the authors of Freedom of Speech in the United States with the Franklyn S. Haiman Award for "outstanding published research on freedom of expression." Thomas L. Tedford taught the course in freedom of speech at the University of North Carolina, Greensboro, for more than two decades prior to his retirement. He received his B.A. from Ouachita College. His M.A. and Ph.D. are from Louisiana State University. He was active in the Commission on Freedom of Expression of the National Communication Association since its inception in the early 1960s, having served as the chair of the commission, editor of its newsletter, and editor of its Free Speech Yearbook. Tedford is coeditor with John J. Makay and David L. Jamison of Perspectives on Freedom of Speech: Selected Essays from the Journals of the Speech Communication Association (Southern Illinois University Press, 1987), and the author of Public Speaking in a Free Society (McGraw-Hill, 1991). His writing on freedom of speech has also appeared in the Speech Teacher, the Free Speech Yearbook, the English Journal, and the American Library Association's Newsletter on Intellectual Freedom. Dale A. Herbeck is a professor of communication and the chair of the Communication Studies Department at Northeastern University, where he teaches courses in communication law and freedom of expression. He received his B.A. from Augustana College. His M.A. and Ph.D. are from the University of Iowa. His scholarship—which includes numerous book chapters, articles, and papers presented before scholarly societies—has been recognized with the Franklyn S. Haiman Award of the National Communication Association, the Distinguished Service Award of the American Forensic Association, the James Madison Award from the Southern States Communication Association, the Robert M. O'Neill Award from the Commission on Freedom of Expression, and the Past President's Award of the Eastern Communication Association. Herbeck also received the Donald H. Ecroyd Award for Outstanding Teaching in Higher Education from the National Communication Asssociation. He has served as president of the American Forensic Association, president of the American Communication Association, chair of the Commission on Freedom of Expression of the National Communication Association, and editor of both Argumentation and Advocacy and the Free Speech Yearbook.